Paddle board yoga, also known as SUP (stand up paddle surfing) has become increasingly popular these past few years and that is exactly why, if you are thinking about giving it a try you should certainly know what the best stand up paddle boards for yoga. The sport combines vinyasa yoga asanas and hatha yoga with surfing and is said to be one of the most difficult types of yoga to perform. It requires a great deal of balance and flexibility, not to mention mental focus, being quite a demanding activity even for the most experienced yogis. Still being an emerging sport, there is little to no information about it at the moment and every source that might give you some insight or actually teach you how it’s done is more than welcomed. In this article we are going to talk about the best paddle board for yoga or the best SUP boards for yoga. You will learn what are the most common types of paddle boards, you will learn about the best brands and the top products that could best fit your needs. If you are interested in the best SUP for yoga, then you certainly need to focus your attention on allround boards. What you need to understand is the fact that most paddle boards are quite similar to surf boards but with a few alterations, depending on what sport variation you plan on practicing. As a result, allround boards are larger (both longer and wider) than your regular surfboard. On top of that, they are also thicker which makes them incredibly versatile and durable. One of the best thing about this type of paddle board is the fact that it gives you enough stability so that you can keep your balance. Additionally, given its size, it is ideal for beginners, as they will have an easier time keeping their balance. So if you are just now beginning with paddle board yoga, this is the type of board you should consider purchasing. It has a round nose and is ideal for lakes and for open waters as well. Flatwater boards are quite similar to allround boards, in the sense that they are a bit wider than regular surfboards and offer extra stability. However, as opposed to the allround boards, flatwater ones are a bit longer and, since we are comparing the two, you should know that they even are narrower. 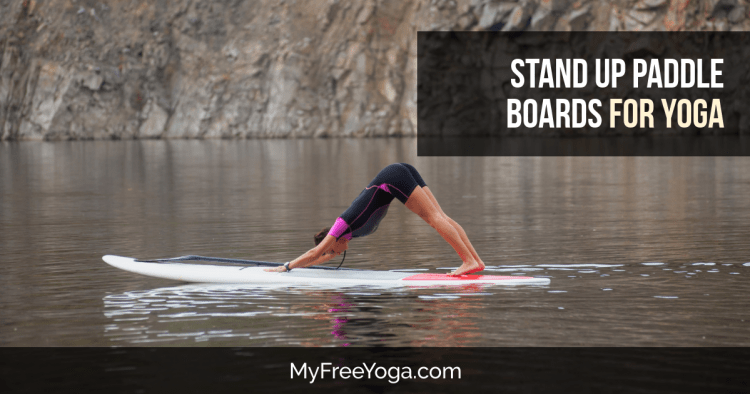 This basically means that, if the allround boards are ideal for beginners, flatwater boards are more suited for experienced yogis, who know how to keep their balance even in open waters. Another difference between the two boards is the fact that the flatwater board has a pointed nose area, which also allows it to glide. In other words, you could use this board for other purposes as well, no only yoga. In fact, most people who purchase this type of board use it for paddle boarding as well, since it has rounded sides, apart from the pointy nose, which allow it to easily glide. Isle is one of the biggest and most respected paddle board manufacturers currently available on the market. One of the great things about this brand is the fact that they seem to be specializing in making the best inflatable SUP for yoga. If other paddle board manufacturers have multiple types of available products, including boards that can be used for racing, Isle has almost created a name form making paddle boards specifically for yoga. This means that when it comes to stability and balance, their boards are the best that there are on the market. On top of that, Isle only uses the highest quality materials for its products and is known for abiding by the highest quality standards. You can count on their paddle boards to be sturdy and durable and you can rest assured that they won’t suffer any damage from water or heat like most boards do after a while. When talking about paddle board brands, you should know that Ten Toes is one of the companies with the most experience in the field. They have been making some of the best paddle boards for yoga for years. The great thing about this brand is the fact that their products are not only sold all over the world, but they are also top rated. They have impressive numbers of positive reviews online, which can only mean that they are doing a great job in manufacturing the items. High quality materials and a strong guarantee from the manufacturer seems to be the recipe for their success. On top of that, they do not only make paddle boards for yoga, but for other purposes as well, so if you are interested in a wider range of paddle board activities, this is the brand to go with. You only have to browse their products in order to see the variety of options you have at your disposal. Peak is yet another amazing brand when it comes to paddle boards. Apart from using amazing materials in manufacturing the products, they also offer customers quite an impressive guarantee. In fact, one of the main reasons why this is such a great brand is the fact that they have an impressive return policy and are open to give refunds whenever customers ask for them. This can only mean that the manufacturer has a lot of confidence in the quality of the product and it is basically a vote of confidence for clients all over the world. One other amazing detail about Peak is the fact that, when selling a paddle board, they make sure to include, alongside it all the necessary accessories, regardless of the activity one would be eager to try. They include anything from a high pressure pump and a coil leash to the paddle and a carry backpack. Now that you have learned about the most professional brands, which are responsible for making some of the best paddle boards for yoga available on the market, here are just a few of the best products of this kind. You should know that there are plenty of choices out there and a lot of items that may seem alike, but there are some far superior when it comes to quality. This is, without a doubt, one of the best, if not actually the best sup for yoga. One of the best things about it is the fact that the manufacturer actually designed it specifically for yoga practicing purposes, which means that it can not only meet your needs, but exceed your expectations as well. On top of that, the paddle board comes with all the necessary accessories. The bundle includes a travel backpack, an adjustable alloy paddle, a pump with gauge, a 10 feet coil ankle leash, a waterproof smartphone carry case, a 9 inch nylon snap in center fin, tail mounted D rings and a six point bungee system. The great news is that the package also includes replacement parts for all items and accessories. The board is made out of highly durable materials, which are suited both for fresh and saltwater, it is incredibly light and once deflated it does not take up much space. Isle is one of the most amazing manufacturers when it comes to making the best inflatable paddle board for yoga. They have years of experience in the business and the products made by this company are always well received, especially by the yogi community. This particular product is made out of military grade PVC and it measures 10.4 X 31.6 X 6 inches. The material it is made from is highly durable and resistant even if it suffers mechanical shocks. This makes it ideal for SUP yoga, but for other paddle board activities as well. The wide nose and wide tail are, however, ideal for providing added stability. The board has a maximum capacity of 255 pounds and the bundle includes the paddle, a carry backpack and a high pressure pump. Additionally, the product also comes with a 60 day guarantee from the manufacturer and a one year guarantee on the materials. This stand up paddle board from Serene Life provides a superior maneuverability given the fact that it has a triple bottom panel fins system which help the board gain more stability, making it easier to handle and steer. One of the main positive aspects of this product is its versatility, since it can be used for a variety of other activities, not only for sup yoga. Additionally, the board was specifically made for beginners, so if you are just now taking up sup yoga, this item is ideal for you. It has a non slip deck so that you can perform each and every pose with maximum grip and in a safe manner. The paddleboard kit includes a coiled ankle cuff safety leash, a manual air pump, oar and a storage bag. Measuring 10 X 30 X 6 inches, the paddle board is easy to inflate and deflate and does not take up much space. Being an experienced paddle board manufacturer, Ten Toes came up with the Weekender model, which is ideal not only for SUP yoga, but for other activities as well. This item is made out of military grade PVC and it measures 10 X 30 X 6 inches. The high quality material guarantees that the board will not get damaged by mechanical shocks, as it is difficult to puncture or tear. The product is highly stable and it is appropriate or recommended for anyone, including beginners. The bundle includes the aluminum paddle, three removable nylon fins and a manual pump. On top of that, the manufacturer provides the product with a very strong, one year warranty. Another great advantage of this paddle board is the fact that it is easy to deflate and stored in a very compact package, making it not only easy to use but easy to store as well. If you need a new stand up paddle board or if you are new to SUP yoga and are looking to buy your first product of this kind, then you should know that there are a few things to consider before making a purchase. After all, buying a paddle board is quite an investment and it would be ideal if it was a profitable one and not an epic fail. As a result, here are some of the things you should keep in mind when buying the best inflatable sup for yoga. Although it is still an emerging sport, paddle boarding is quickly growing and there are far more people willing to try it each year. As a result, the equipment has evolved and there are plenty of models available on the market, depending on the type of activity you are interested in. Since you need a paddle board for yoga, you need to focus on finding one that has a rounded nose and is wide enough for you to be able to do all the poses. In other words, you need an allround board, which provides greater stability. Most paddle boards for yoga are inflatable, so you need to make sure that the materials that are used in manufacturing it abide by the highest quality standards. Military grade PVC is usually used in the manufacturing process, but there are others more or less durable. On top of that, you also need to make sure that the deck has a non slip surface, so that you can avoid unpleasant falls. If you are new to this then you should know that paddle boards are not enough on their own. They need to come with loads of accessories, including ankle leash, pump and detachable fins. Apart from all the above mentioned features, you will also need to do some research regarding brands and manufacturers, in order to make sure you purchase your product from professionals. Additionally, make sure to check both the weight of the board and its maximum capacity. All in all, picking the best stand up paddle board can be a difficult task. In this article you learned that the best one available at the moment is the Peak yoga inflatable stand up board, because it includes a great number of accessories with spare parts, which makes it ideal for expert yogis. The SereneLife SUP is amazing because it has the highest maximum capacity, making it great for people with above average weight. Last but not least the Isle Airtech inflatable yoga stand up board is very light and wide, being ideal for beginners and people interested in other activities as well. However, each and every one of the products on our list is professionally made. The difference is only made by your particular needs. Let us know what you bought in the comments and how it has worked out for you! I have an Armie Armstrong paddleboard for yoga. Made in New Zealand. It is strong, stable and solid. You have good grip. It is light enough to carry easily. The colours are cool as well. Love it!